Professional Development Schools were created with a desire to forge a tight link between K-12 education, preservice education and ongoing teacher professional development. 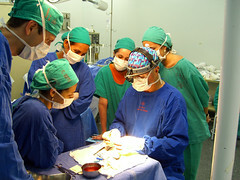 Similar to teaching hospitals where medical residents and interns work closely with skilled medical professionals to provide patients with a high level of care, professional development schools provide new teachers with real-world experience under the guidance of skilled practitioners and professors. Just as most teaching hospitals are centres of innovation, K-12 students that attend professional development schools are often exposed to innovative instructional strategies delivered in an environment that seeks to provide an exemplary education that will serve as a model for the rest of education community. Housing university faculty and associate teachers in the same building can also serve to reduce the distance between the ivory tower and classroom practice. Ensuring that teacher candidates are provided with an appropriate balance of theory and practice is essential to supporting ongoing professional growth. The suggestion that initial teacher training should bypass universities and take place entirely at school-based training centres, so that teacher candidates can focus on practical experience, is gaining momentum in the United States. Alternative teacher certification programs that are field-based and circumvent the need for college/university accrediation can be found in almost every state. While preservice teachers may initially benefit from more practical training, that provides them with greater confidence in their ability to quickly establish their own classrooms, an over-emphasis on practical experience can result in routinized training that is devoid of the theoretical foundation that guides the educational process. The end result may be skilled practitioners that can implement the routines and strategies that they were trained in, but they may struggle to find a suitable response to unique problem or challenge. While nurse-practitioners can provide excellent care when responding to the common cold, most patients would choose to visit a specialist to diagnose an unusual polyp. Educators that receive an appropriate balance of theory and practice and are exposed to educational research during their training may be better equipped to diagnose your child's unique learning challenges. Consequently, professional development schools may be uniquely positioned to provide teacher candidates with the appropriate dose of theory and practice needed to support ongoing professional growth. In response to Chris Wejr's blog post about Autonomy in Teacher Training? I found the original post and the resulting comments to be very thought provoking and quickly realized that a simple comment would not be enough. Firstly, it is important to acknowledge that preservice training is simply the start of a lifelong learning journey. While it would be great if recent graduates had a complete understanding of current assessment & instructional practices, comprehensive literacy, digital/media literacy, 21st century fluencies, technology integration etc... These are skills that many mid-career teachers are still developing. One of the functions of preservice education is to plant the seeds of knowledge that will grow and develop with the support of skilled associate teachers and mentors. This does not discount the need for teacher candidates to have a foundational understanding of the technological resources and strategies that can be used to enhance teaching and learning. I agree with many of the other commenters, that there are not enough teacher education programs that include technology integration and TPACK as part of their training. The challenge is finding the time. Teacher training programs are already jammed packed with too much information that is delivered in too little time (This is especially true in Ontario with its eight month program). As noted in some of the replies to the Chris Wejr's post, the key to effective preservice education is pairing teacher candidates with skilled associate teachers that can build on the foundation of understanding that was provided to teacher candidates while on campus. For many teacher candidates, the lightbulb of understanding does turn on until they can see these theories and principles at work in the classroom. While some educators would like to disregard educational theory and focus solely on current practice, it is important to remember that current practice is the result of previous theoretical principles. A foundational understanding of theory provides educators with a framework that can be used to analyse and synthesize new information so that they create innovative solutions to future challenges. Being prepared to overcome future challenges is a key goal of the EdTech Leadership Cohort at Brock University. In addition to their technology training, they were provided with an opportunity to develop their leadership competencies and examine the benefits and challenges to classroom technology integration so that they would be able to provide insight and guidance to their colleagues and school community. Since the start of the program they have used their blogs, Twitter accounts and Googles Docs to reflect on and discuss the challenges, while also sharing what they have learned by creating instructional videos, blog posts and delivering numerous workshops and coaching sessions to their associate teachers, instructors, peers and practicing teachers. More important than anything they will do this year, is the future impact that they will have as they transition into the profession and have the opportunity to further develop their knowledge and leadership skill. When discussing the challenges of integrating technology into teacher education we need to focus on the future and how to prepare teacher candidates for the future of education. As access to educational technology grows it is paramount that as these tools are used to support 21st century teaching and learning and don't simply replicate traditional classroom practices. One of the keys to creating 21st century learning experiences is to ensure that the instructional strategies used in the classroom take advantage of the affordance of technology to create open, collaborative and dynamic learning experiences. Tech-enabled teaching strategies that are open, collaborative or dynamic have the potential to engage students in ways that were not possible or prohibitively burdensome in the past. When learning is open and transparent students can learn from each other and take advantage of the benefits of social learning to support academic success. Social technologies like Moodle, Ning, and Schoology provide students with academically-focused opportunities to interact with their peers. Increasing the number of educational interactions between students can serve to enhance a sense of classroom community and allow engaged student to serve are models or a support system for students who experience motivational difficulties, are vulnerable to educational failure or show signs of disengaging from the learning process (Furlong & Christenson, 2008). The use of technology can also make it easier to create an open a window into what takes place in the classroom by creating an efficient way to provide parents with the information necessary to support the learning process at home. Classroom websites, blogs and even Twitter allow parents to stay informed about daily assignments and homework and even view videos or images of completed projects or presentations. More so that traditional classroom tools, the collaborative and participatory nature of many of the latest classroom technologies can make academic collaboration significantly easier for students and teachers. Collaborative tools like Wikis, Google Docs, and Office 365, encourage students to become active participants or co-producers rather than passive consumers of content (McLoughlin & Lee, 2007). In addition to being an essential 21st skill, collaboration and the opportunity to work with their peers can be used to engage students who are at risk of disengaging from the educational process. Dynamic instructional strategies acknowledge that teaching does not always have to be a unilateral process and that the classroom teacher does not need to be the only ‘teacher’ available to students. Integrating the use of educational videos from YouTube EDU, Learn 360, or Knowledge Ontario eResources allows teachers to provide their students with a variety of ‘teachers’ that can address an array of different learning styles. Tools like Skype, Adobe Connect, and Google Hangouts provide an easy way to bring additional teachers and experts into the classroom so that students can engage in real world learning experiences. In addition to facilitating interactions with experts or guest speakers from diverse background, these authentic learning opportunities can also serve to heighten the relevance of classroom learning and support the development of global and digital citizenship. McLoughlin, C., & Lee, M. J. W. (2007). Social software and participatory learning: Pedagogical choices with technology affordances in the Web 2.0 era. Paper presented at the Australasian Society for Computers in Learning in Tertiary Education Singapore. 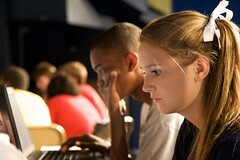 The Fundamentals of Blended Learning from Education Elements on Vimeo. Just as the social features of many of social media resources has attracted the attention of millions of young people, these same features have the potential to also draw the attention of students to the learning opportunities provided by their school. 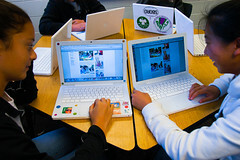 Educators could take advantage of these social and interactive features to encourage students to become actively engaged in co-constructing their learning experience with their teachers (McLoughlin & Lee, 2007), collaborating with fellow students, and sharing resources and ideas beyond the schoolhouse walls. Using social media resources such as Google Apps for Education, Office 356, Moodle, and Ning as repositories of learning objects would allow students to access valuable and necessary learning objects regardless of their location and time of day. Not only could this negate the excuse, ‘I left my book at school’, easy access to a plethora of learning resources may also help to extend the amount of time students time spend engaged in academic pursuits. Within the traditional classroom, providing students with supplementary learning resources can be very expensive and logistically complicated. Including hyperlinks to supplementary resources to extend the learning experience in addition to required resources and class assignments as part of a class Moodle or Ning site may serve to support academic engagement by extending the amount of time a student spends actually doing homework or related school projects. The results of the 2009 High School Student Engagement Survey (HSSSE) noted that only 2% of student report that they were never bored in class, while the majority of students (66%) reported being are bored at least every day in class and one out of every six students stated (17%) stated that they are bored in every class everyday. The dynamic and participatory nature of many social media resources could be used to re-engaged previously bored students. Collaborative and participatory tools like Wikis, Google Docs, Office 356, Poll Daddy and Survey Monkey can encourage students to become active participants or co-producers rather than passive consumers of content (McLoughlin & Lee, 2007). The HSSE results also revealed that instructional methods that involved working with and learning with their peers were the most highly rated of all instructional methods that teachers use (Yazzie-Mint, 2009). Creating learning experiences that are social and interactive would serve to enhance behavioural engagement, which is reflected in active class participation, asking questions, and participating in discussions. The second most cited reason given by students who considered dropping out of school was that they did not see the value of the work that they were being asked to complete (Yazzie-Mint, 2009). This highlights a lack of cognitive engagement, which refers to the extent to which students perceive the relevance of school to their future aspirations (Furlong & Christenson, 2008). The HSSSE survey also noted that of those students who reported being bored at school, 81% indicated that it was because the material was not interest-ing, and 42% said that their boredom was caused by lack of relevance of the material (Yazzie-Mint, 2009). To counter classroom boredom and support cognitive engagement, social media resources like iTunesU, Twitter, Skype and YouTube could be used facilitate authentic learning experiences that require students to learn from and interact with experts outside the classroom. Integrating social media resources like Blogger, Twitter, Tumblr and Wordpress into the classroom may provide students with greater opportunities to get to know their peers and in turn develop a positive relationship with them (Rutherford 2010). This may result in greater levels of affective engagement, which refers to a sense of belonging and connection to their peers. Affective engagement also includes the sense of connection to and the support students receive from the adults in the school (Furlong & Christenson, 2008). Social media can also be used to enhance and increase the number of interactions students have with their teacher by overcoming the barriers of time and location (Rutherford 2010). Increasing the number of potential opportunities to interact with students regarding schoolwork can be as simple as having teachers use a blog, Tumblr or Twitter where students can ask questions or leave a comment. As the number of positive interactions a student has with a teacher increases, so does the likelihood that a student will have the opportunity to develop a supportive relationship with at least one adult. Yassie-Mint (2009) states that connecting with at least one adult at the school is critically important for students to remain in school and be engaged with the learning environment. The importance of connecting with even a single adult is high-lighted in the fact that of the students who have considered dropping out, 16% identified “No adults in the school cared about me” as a reason for thinking about dropping out (Yazzie-Mint, 2009). Rutherford, C. (2010). Using Online Social Media to Support Preservice Student Engagement. Journal of online learning and teaching, Vol. 6(4).